Catering companies are similar to all other businesses. Customer satisfaction is a priority that catering companies strive to achieve. It helps in boosting their competency in the industry. Attaining customer satisfaction is facilitated by the set strategies by the companies. Customers strive to attain trustworthy relations with the catering companies. Most people will use word of mouth or other forms of advertising to retain and attract new customers. This article will discuss some of the strategies used by catering companies to boost the customer experience. Realistic Menu – It is a challenge for most companies to come up with a menu that satisfies the needs of customers and achieve it with ease. Attaining a balance is crucial. The biggest challenge for caterers is when clients come up with unrealistic targets to work with or attain. In such cases, catering companies will negotiate, change an ingredient or alter the menu. Some people will perceive this move as poor service. However, communicating with the clients early enough will help to avoid disappointments in the end. Address the likely issues early to come up with an alternative of attaining the desired outcome. Variety – Availability of a broad range of services gives the customers options. Nowadays, it is difficult to find a caterer that only deals with food. Their services will extend to cover decorations, set ups, clearance, table arrangement and food service. This is an added advantage for a catering company since it will be convenient and cost effective for a client to work with one catering company. This will also increase the number of potential customers. 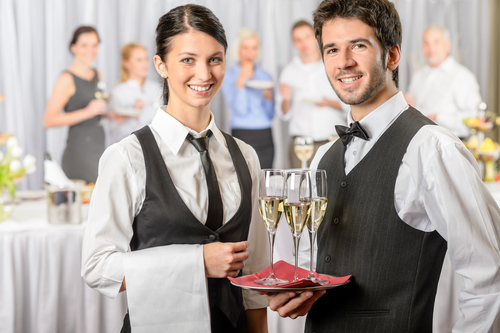 Attention to Detail – It is overwhelming for caterers dealing with a large event. This can compromise the execution of small details. There are various differences in the performance of catering companies. A great factor that contributes to the difference in execution is observing the small details. You need to be precise with every activity. Be keen even on small tasks such as folding a napkin. Keeping time will also reduce the chances of problems and delays occurring. Competitive Advantage – There is a lot of competition in the industry. Therefore, you need to make sure that everything is done to satisfy the customer. Working towards customer satisfactions will help in attaining the client experience thus acquiring a competitive advantage over others. Such progress is good for the reputation of the business. Flexibility – You need to be flexible on all areas. Your pricing system should be flexible enough to meet the needs of customers. You also need to make your services flexible enough to cater for the different preferences of the guests to host. For instance, consider cases of allergies and beliefs. It can be difficult to flex to meet the needs of every individual. However, a good catering company stands out for its ability to use creativity to cater for all the needs. When coming up with a strategy for your catering business, you need to consider both strengths and weaknesses. Focus on making your business better by improving on your weak areas and using the strengths to acquire a competitive advantage. You also need to take time and understand the needs of your customers and plan. This will ensure that every activity is accounted for, giving you ample time to address each need at a time. Assess the best alternatives in case of a dilemma and advise the customer. Maintaining healthy and transparent relations is a good approach of attaining the customer satisfaction and good image for the company.